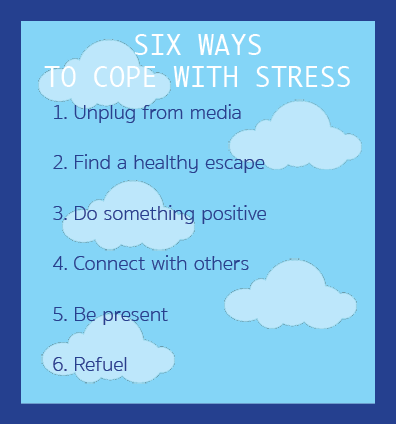 The end of the semester can be a stressful time, so it's important to make sure you take care of yourself and find healthy ways to deal with the extra stress and anxiety this time of the year can bring. Unplug – Limit your media consumption, particularly, the 24-hour news cycle of social media. Instead of constantly scrolling through newsfeeds, try to limit your exposure. Find a healthy escape – Do something engaging or energizing to manage your feelings, rather than turning to substances like alcohol. Get outside, practice mindfulness, exercise, write in a journal, meditate, make art or watch a funny movie. Laughter is often a good antidote for stress and anxiety. Do something – Channel your feelings into positive meaningful activity. Get informed and be proactive around issues that matter to you. Engage with your community through volunteering and advocacy. Connect – Engage with supportive friends and allies. Talk it out if you need to, but also communicate your boundaries when needed. Not everyone will share your perspective, so make sure to avoid or limit conversations that have the potential to get heated. Be present – It is important to be aware of and acknowledge our thoughts and feelings. Pay attention and give yourself permission to feel the way you do. Although avoidance and compartmentalizing can be useful, unaddressed intense emotion can also have negative impacts. Refuel – Get back to basics and focus on restoring yourself. Get enough rest, eat well, drink plenty of fluids, and limit your alcohol and caffeine intake. Moving around daily also helps to reduce stress and anxiety levels. One way to take the edge off looming projects, papers and exams this week, is at Pat Walker Health Center's Counseling and Psychological Services (CAPS) end-of-the-semester Play Day, happening from 11 a.m. to 2 p.m. on Wednesday, ‪Dec. 7, in the Arkansas Union Connections Lounge. This day is designed help students take a moment, relax and have fun in the days leading up to finals. "This is easily one of our favorite events of the year because we get to help students learn how to practice relaxing" said Elizabeth Stout, Ph.D, mental health clinician and outreach coordinator for CAPS. "We encourage students to come by and take a moment to have fun and learn about how they can better manager their stress during finals time." Play Day will include many different activities for students to help relieve stress such as henna tattoos, yoga demonstrations, coloring, building with Legos, popping bubble wrap, and of course play dates with dogs from Fayetteville Animal Services. CAPS will also have on-site clinicians to help discuss tips with students and promote wellness.